Two or three play. Each chooses a different color. The players then take turns placing a triangle of their color into a vacant space. After the first turn, a new triangle must touch at least one previous triangle at at least one point. The game ends when all spaces are occupied. The quadrilateral must be fully occupied. The quadrilateral must have more than 2 triangles. Exactly half the triangles in the quadrilateral must belong to the current player. The outline of the quadrilateral may not pass between two adjacent triangles of the same color. Because of the third condition, a quadrilateral can be scored only if it contains an even number of triangles. 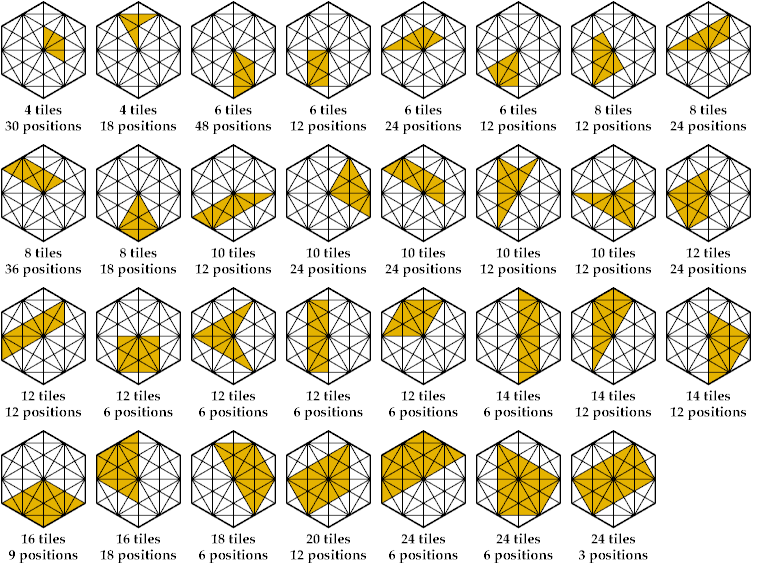 Here is a picture of the 31 sizes and shapes of scorable quadrilaterals on the board. 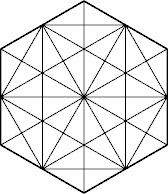 The board contains 468 such quadrilaterals. Thanks to Jonathan Clark for giving me a Quadrigon set—in fact, two of them.